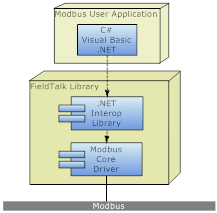 This FieldTalk Modbus Slave Library for .NET allows you to incorporate Modbus slave functionality into your your VB.net and C# programs. The two components are contained in separate files: FieldTalk.Modbus.Slave.dll contains the .NET Interop Library and libmbusslave.dll the native Modbus Core Driver. These two library files have to be deployed with your application. For classic .NET Framework 4.0 and 2.0, the deployment of the native code library is taken care of by the FieldTalk.Modbus.Slave.prop file which the NutGet package manager will automatically add to your project. With that file, when compiling, a bin/x86 and a bin/x64 subfolder is created in the bin directory and the native libraries copied into these subfolders. When the .NET assembly is loaded, the correct native library will be loaded from one of these two sub-folders. The library's API The library is organised in two categories of classes. One category implements the Server Engines for each Modbus slave protocol flavour. There is one Server Engine class for each protocol flavour and a common Server Engine base class, which applies to all protocol flavours. Because the two serial protocols ASCII and RTU share some common code, an intermediate base class implements the functions specific to serial protocols. The second category of classes is Data Providers classes. Data Provider classes represent the interface between the Server Engine and your application. The base class MbusSlaveServer contains a protocol unspecific contains a protocol unspecific Server Engine and the protocol state machine. All protocol flavours inherit from this base class. The class MbusAsciiSlaveProtocol implements the Modbus ASCII protocol, the class MbusRtuSlaveProtocol implements the Modbus RTU protocol and the class MbusTcpSlaveProtocol implements the MODBUS/TCP protocol. Before a server can be used, a Data Provider has to be declared. A Data Provider is created by declaring a new class derived from MbusDataTableInterface. The class MbusDataTableInterface is the base class for a Data Provider and implements a set of default methods. An application specific Data Provider simply overrides selected default methods and the Modbus slave is ready. After a protocol object has been declared and started up the server loop has to be executed cyclically. The Modbus slave is ready to accept connections and to reply to master queries.